One of my personal favorite Blues Blogger articles was something I wrote on legendary bassist Jaco Pastorius… At the time I was writing that piece, I was also reading about Australian bass prodigy Tal Wilkenfeld whose latest accomplishments have been nothing short of mesmerizing. As different as Jaco and Tal may be, I discovered a similar tone. I became interested in writing something about Wilkenfeld, as she is an extremely talented individual. She has a mature soul and I hear many influences flow throughout her playing. One thing for sure, she is a very cool and extremely entertaining young lady to watch. was born in Sydney Australia… She started to play guitar at 14, and then later switched to the bass 3 years later. 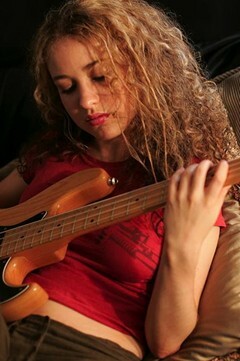 Wilkenfeld would discover that the feel of the bass best matched her personality and form of expression. Making a bold move, Wilkenfeld decided to drop out of high school at 16 and move to the United States; choosing to spend her time focusing on a music career. She first settled in Los Angeles and after completing school at The Los Angeles Music Academy, moved to New York City. It didn’t take long for Wilkenfeld to get work. She started performing as a side person and band leader and eventually gained recognition around New York’s jazz clubs. After only several months of bass playing, she was offered an endorsement deal with Roger Sadowsky; an independent guitar and bass designer and manufacturer… At the age of 20, she recorded her debut album Transformation. It features musicians Wayne Krantz, Geoffrey Keezer, Keith Carlock and Seamus Blake. Tal not only played bass, but composed, arranged and also produced the album. Shortly after Transformation, she would go on to have a guest spot with The Allman Brothers Band. The gig that got her an incredible amount of public awareness was her collaboration with Jeff Beck for his summer of 2007 European tour. After playing in Europe the group would team up with on Eric Clapton’s Crossroads Guitar Festival in Chicago. In November 2007, while playing another gig with Beck at Ronnie Scott’s jazz club in London, Tal was joined on stage by Eric Clapton; a truly incredible accomplishment to cap off the year. with musicians such as: Herbie Hancock, Steve Vai , Joss Stone, Susan Tedeschi, Hiram Bullock, Wayne Shorter and Corinne Bailey Ray. In addition she has been voted as “The Years Most Exciting New Player” in Bass Players 2008 Readers Choice Awards. Quite an impressive portfolio by any veteran’s standards let alone a 22 year old who’s been playing the bass less than five years. It’s hard not to notice Wilkenfeld’s incredible achievement. Her story is truly inspiring! Tal’s haunting soulful sounds may even of had the great innovator Jaco nodding with approval. Most musicians have talent, but this one has “the gift”. What a remarkable young woman. Cool, i hope she will be more popular in the future getting involve such rock or pop stars.. Yes Tal is very remarkable… It will be interesting to see what avenue she explores in the future. While it is hard to top some of the Beck gigs, I must admit, she seemed totally comfortable in the clips I saw of her with Chick Corea… I hope she continues to do whatever music she wants. I will certainly be curious as to what tomorrow brings for Tal. Another great post BB. Keep up the good work. I heard bout this young lady before, but never seen videos before. Have watched and listened to these on your post several times already. Hope you don’t mind me hanging around. Thanks. You rock dude. I first saw Ms. Wilkenfeld playing with Beck on the Crossroads concert. There were no musician credits so I Googled ‘Beck bass player’ & I found her. I learned that she is a decade older than she looks & that she has a recording out which I now own & love. Whatever happened to Tai, I can’t find a website, or myspace or anything. It seems she droped off the planet? Hi Thrush… They may be working on her website. Tal is playing with Jeff Beck at The Enmore Theatre this weekend in Sydney, New South Wales… Wish I was there!!! We hope to hear much more from Tal! Yeah, I remember this article. One of my favorites!!!! She sure is great! what an amazing talented young lady whatever avenue she chooses to continue in i am sure she will succeed!!! Definiy=tly am looking forward to listening to her next performance and/or album. Thanks for a reposting such a great blog!!! I can’t believe that interviewer in the video was allowed on the air. She is an amazing artist, and beautiful, and high-spirited. Oh lordy, I do love Chick Corea and that was one of the best videos I’ve seen. Tal looks like a little girl playing with grown ups but her music is phenomenal. If she can back up Chick, she is of the highest musicianship. Chick has taken jazz to the next level — his innovations demand the best from the people who play with him. Then there’s Jeff Beck and I am transported. Can’t say anything else. What a great tribute and review BB… your hunches always seem to prove out great !! Let’s see now about Tal Wilkenfeld… a born again bass playing prodigy… by about 22 years old and 5 years only on bass guitar she’s accomplished what many musicians only dream of !! She is playing in Chick Corea’s band with Wayne Krantz, Geoffrey Keezer, Keith Carlock and Seamus Blake… hopefully I have that right… and has played with the likes of Jeff Beck and had Eric Clapton join “her” on stage !! I’d say that’s a “fantastic 5 years” for anyone… even for anyone who’s been in the business 5 times longer than her !! Chalk up another new favorite for me now thanks to the BluesBlogger </i… you have scored another 10 in my book… thanks again for re-reviewing this magnificent review… whewww !! PS. …. I see I have made a small html mistake… darn it… maybe someday we will get to preview our post b4 hitting “submit”… lmao… not a big deal… “I just feel silly when I make those mistakes” !! Still Bluesblogger… the “top blues review site”… I have found… ever !! Wilkenfeld is definitely an inspiration. Someone who courageously pursued her dream. I’m afraid to turn the bass player in my band on to Tal, I hate to see a grown man cry. After reading this blog entry I spent 4 hours listening to her stuff that’s on the internet. She is incredible! Another add to my CD wish list for Christmas! Tal has something that can’t be learned. She has a feeling for the music that most players with 20 years experience don’t have. What a great talent! So inspiring! You can see she loves every minute of it. She makes me wanna learn more and more. Awesome to see her play. I believe Tal accompanied Jeff to the Rock and Roll Hall of Fame Concert at Madison Sq. Garden and I was intrigued by this young girl. I just got finished watching Tal with Jeff Beck at Ronnie Scott’s. All I can say is Wow. I can’t wait to check out her music and am thrilled to find the Blue Blogger site. After seeing this – I think it’s time for me to hang it up. This young lady is amazing. Simply amazing. I am a new bass player, who know jack sh$%t about playing…yet. I love watching you and hope to learn 5% of your skills! keep up the great work!!!! Yeah, she’s collaborated with the greats and what not, but I think the greatest thing she’s done so far is Transformation. There’s not a dull moment on there, and she did a great job producing it. She deserves a very long career – and I hope she never abandons jazz and fusion. She rocks! Not to take any of her thunder away, but you should all check out Julie Slick, who is also a great young bassist. Her and her brother Eric are the rhythm section of the Adrian Belew Power Trio. For those who don’t know, Belew is King Crimson’s front man, who has also played for Zappa, Bowie, Talking Heads, Nine Inch Nails and many, many others. I am interested on learning how to play bass guitar since I’m a big fan of music. Tal looks very talented and amazing. Looking forward to read more about her talent and guitar skills. Thanks!